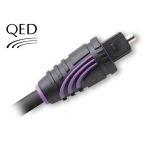 A common use for the DIGITAL OPTICAL (S/PDIF) interface is to carry compressed digital audio as defined by the standard IEC 61937. This mode is used to connect the output of a DVD player to a home-theater receiver that supports Dolby Digital orDTS surround sound. Another common use is to carry uncompressed digital audio from a CD player to a receiver. This specification also allows for the coupling of personal computer digital sound (if equipped) via optical or coax to Dolby or DTS capable receivers. 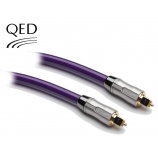 QED Reference Optical Audio Cable is a reference all-purpose optical digital interconnect, ideal for use between a CD transport and DAC or in high quality audio visual applications that include DVD or Laser Disc players. It is compatible with TOSLINK™ optical input and output sockets.